Etsy is a powerful fastest-growing marketplace that gathers millions of artists, designers, and crafters across the globe. However, the more your online retail expands, the higher demands of your business growth appear. That`s why, many successful merchants, after gaining the paramount experience of selling on this world-known marketplace, decide to import products from Etsy to WooCommerce. Selling on standalone, feature-packed shopping cart gives them full authority over their stores and allows to take advantage of its robust functionality, superior flexibility, and high-level control. As a company that specializes in eCommerce database transfers, we decided to help those retailers who have hesitations and fears concerning such kind of product import. Today we`ll uncover the switch peculiarities and will show you that is nothing to be afraid of. At first, let`s discover the main reasons why Etsy to WooCommerce product import may be a good idea. 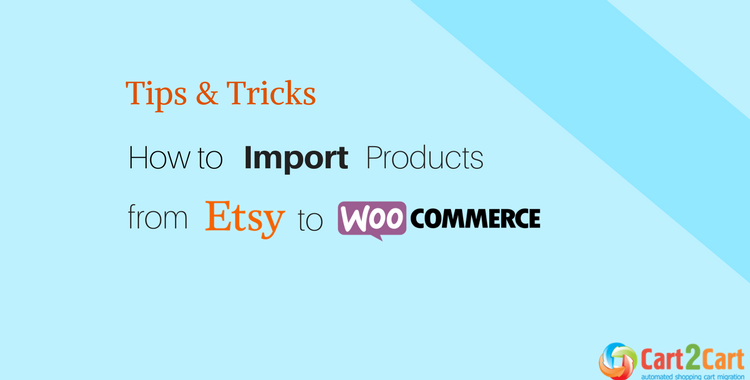 Why to import products from Etsy to WooCommerce? The foremost thing that drives thousands of online owners to reconsider their switch from marketplace to standalone shopping cart is high maintenance costs. Due to Etsy's pricing policy, you're expected to pay $0.20 fee per listed product and 3 - 4 % fee per sale depending on the location of your bank account. For sure, if you have low sales, the fees won't hit your pocket, and that's good. But if you're having bigger inventory and passing out your products at increasing speed, such cost conditions won`t work best for your revenue. Regarding WooCommerce, this open-source solution is free to download and use. It allows you to list the unlimited number of products without fees or restrictions. With WooCommerce, you're the one who controls everything: from maintenance to new audience engagement, website conversion funnel building, etc. We cannot but say that with opportunity comes responsibility. If you`re a tech-savvy or plan to hire the dedicated team of IT geeks, no problems then. A huge plus is that it offers hundreds of extra store enhancements like additional plugins and modules for free. Concerning the paid extensions, you'll be expected to spend from 29$ to 130$ and more. It`s not a mystery that the retailers who are aiming to continually develop their brands will simply lack the necessary functionality offered by marketplace environment. It`s true that Etsy gives little control over listings; the users have limited customization capabilities toward e.g. pictures or text. But agree, even such, at first sight, minor modifications (eye-grabbing product or image alt tag description) can boost your SERP visibility and eventually drive more traffic. The same concerns the whole store look modification. We won't exaggerate thing if say that it`s quite challenging to apply the enhancements with a small number of customization tools. In its turn, WooCommerce is the dynamic, feature-rich eCommerce platform that allows you to tweak and twist your e-store to a whole new level. You can modify the every needed area: from the name, logo and your store-design to checkout, billing, tax setting, etc. What's more, thanks to WooCommerce compatibility with WordPress, you can benefit from hundreds of thousands of templates, plugins, and extensions that will give your store both the professional look and feature-rich functionality. It`s obvious that Etsy, being a top-ranked marketplace with over 1.8 M users and even more 30.6 M buyers, offers you a sufficient boost of exposure. Your products can appear in recommendations, top-rated positions may be easily found in the list of categories, etc. Apart from that, it's essential to emphasize that this traffic is less targeted than to independent websites. The fact is that all your goods will be placed among tons of similar products which are also worthy customer`s attention making it more difficult to stand out from piles of “unique” stores and grab user's preference somehow. When it comes to standalone WooCommerce e-store, it`s much harder to get your first visitors. However, every medal has two sides. When the shoppers visit a specific site, they are exposed to your products exclusively where you have no competition and an excellent chance to charm them with your brand. What`s more, if customers decide not to purchase any of your items (at least not yet), with WooCommerce you can easily make them change their mind with remarketing. This amazingly useful tactic is not available on Etsy though. One of the key merchant`s tasks is to increase brand awareness and boost an online store exposure to a targeted audience. Luckily, you don't need much time to figure out how to achieve these goals. Thanks to WooCommerce effective marketing and SEO tools, it`ll be much easier to convert a visitor into your potential buyer! These are three vivid reasons that urge online retailers to import products from Etsy to WooCommerce. Now, we are gently approaching to revealing the primary question that concerns the Etsy product importing itself. What is the best way to do it? How to import products from Etsy to WooCommerce? There are several ways how to do it. The best way to define which one suits your needs is to get acquainted with all of them. And that is exactly what we're going to do now. You can use CSV files to import products from Etsy to WooCommerce. Go to your Etsy Admin Panel, choose “export data into a CSV file” and upload it to your computer. Everything seems to be very easy, but in fact, it's rather complicated. You have to be ready to encounter some obstacles during the procedure. E.g., it`s not possible to move product variation. To do this, you'll need to create them manually from the beginning that is time-consuming, agree. Take into account that this file type can only contain text, so if your items include images (and in most cases they do), it`ll be quite a tricky task to transfer them. You have to upload them to your WooCommerce e-store because Etsy CSV file can include image URLs only. The critical thing to take into account is that your CSV file size can’t exceed the limit 15MB. That`s why, if you have a wide range of products, make sure you took enough time to solve the possible errors. If you have a glimpse on WooCommerce marketplace, you'll undoubtedly find many plugins that deal with product import. All of them work through the intermediacy of CSV files meaning that it`ll help you to import Etsy listings to a WooCommerce store but you'll need to do the database export on your own. This is not a major disadvantage of this solution. The main drawback is that in most occasions the plugins support products migration option solely. The data like images, attributes, categories are under strict limitations because they are not included in the file format. Another barrier is that often the developers don`t provide support or it`s not sufficient enough to cope with fuzzy tech issues. Before choosing this solution, it`s crucial to double-check the source you're taking the plugin from and the add-on. Lots of them are of questionable quality, and your switch may result in data loss or relations breakdown. To avoid all these hassles, we highly recommend you to choose only those plugins that come from safe sources. Trusting your Etsy to WooCommerce products import to a reliable, feature-rich solution with 24/7 support would be smart. Is there any? Cart2Cart is the one. Being a leading automated shopping cart migration service and an official WooCommerce partner, it lets you transfer products from Etsy to WooCommerce with minimum efforts and tech skills. With Cart2Cart service you`ll reinforce your business. It migrates the extensive list of entities and offers a wide range of additional options which broaden your eCommerce possibilities. Migrate images from products descriptions, categories descriptions and blog posts descriptions, etc. The tool has no data amount limitations that`s why it becomes an ideal fit for small and large size businesses. A great benefit of Cart2Cart service is that it allows you to estimate the approximate costs for Etsy to WooCommerce product import for migration by simply entering the number of products, customer and orders you need to migrate. Seems like a good option? Give it a free try! Cart2Cart offers a free Demo migration that prevails a full-scale one and will move a limited number of data directly to your live WooCommerce store or a test one provided by the service. If it meets your expectations and needs, launch a comprehensive Full migration and get your live WooCommerce e-store in couple of hours. If you have questions, contact Cart2Cart 24/7 support team, and they will gladly lend you a hand! If you need the developer`s advice, our devoted technical engineers will provide you with all the required details and assistance during the migration. It`s time to give your business a new level! Import products from Etsy to WooCommerce with the help of simple Free Demo Migration and and enjoy your business growth to the fullest!